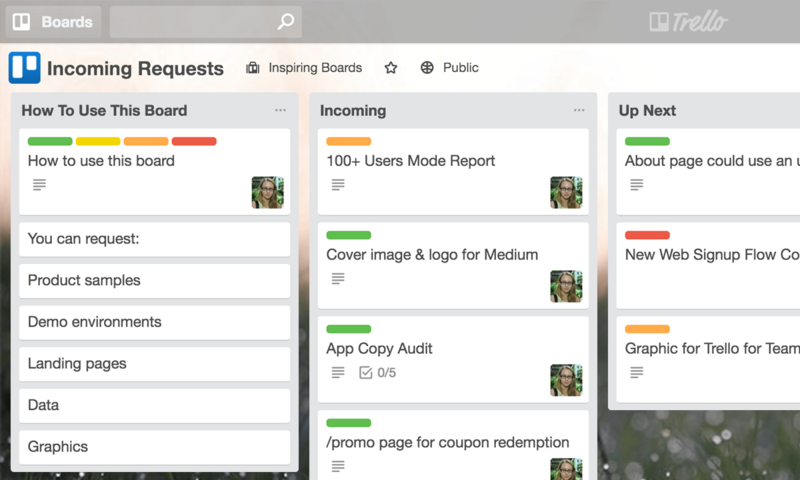 Whether launching a new product, campaign, or creating content, see how Trello helps marketing teams succeed. What makes marketing teams truly productive? All marketers have one thing in common: they wear a lot of hats. On any given day, marketing teams are collaborating on a variety of projects, campaigns, events, and product launches. A marketer’s gears are constantly shifting between editorial calendars, social media channels, website landing pages, product launch schedules, and analytic platforms. With all of of this competing work, how can you manage your marketing team to work productively and exceed monthly business goals? It’s a simple strategy of organization and communication. Being in-the-know is crucial for any team management. With the right tools in place, everyone can organize their work transparently and communicate asynchronously so every member of the marketing team is on the same page. 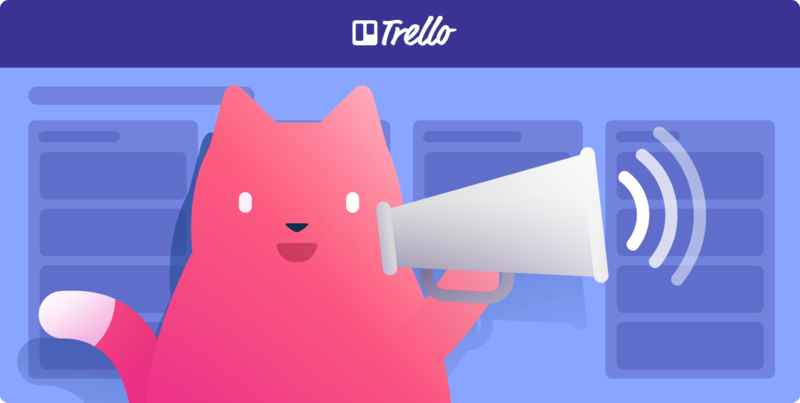 Our own marketing team at Trello uses the boards, processes, and Power-Ups below to manage their marketing workflow and to stay aligned on campaign statuses, updates, resources, and successes—no matter where they are in the world. Get inspired, copy the boards, and make them your own! What is an editorial calendar in marketing? It’s your blog’s command center. With this board, your team can seamlessly coordinate content creation, editing, and production with internal and external authors, while keeping an eye on the publishing calendar and distribution strategy. At a glance, see the status of every blog post from fresh idea to published post. 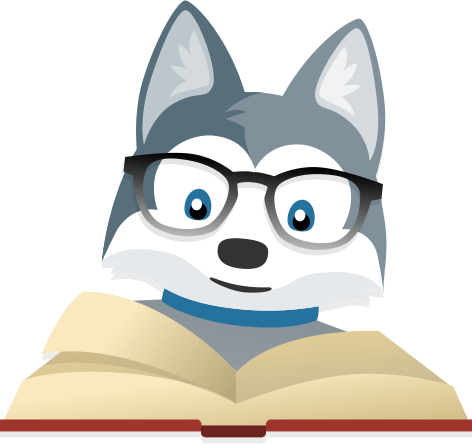 Manage drafts, illustrations, and assets for each blog post by attaching content to its respective Trello card. Make sure nothing falls through the cracks, like social media posts, by creating a publishing process with checklists. Keep everyone in the loop by adding editors, designers, and social media managers to cards. Get perspective on your publishing pipeline with filterable card labels and a calendar view. Create a stronger sense of transparency within your marketing team and the company. Get a high level view of marketing goals, current projects, and what’s up next for the team. 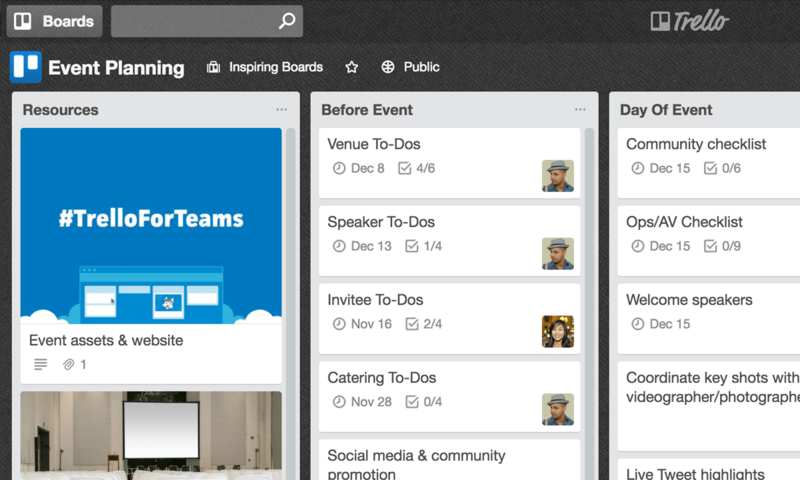 Easily find project leads, goals, updates, and related Trello boards where work is taking place for specific projects. 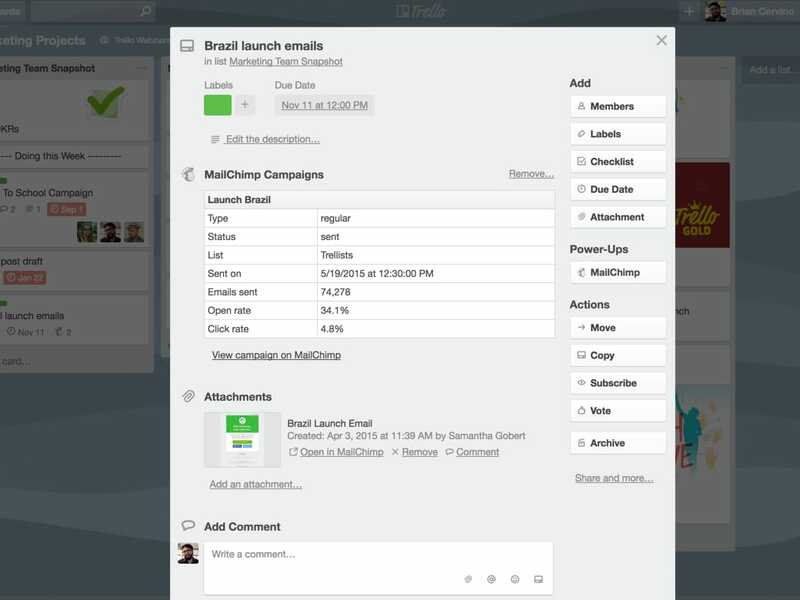 Create team transparency by sharing tasks for the week, as well as personal availability. 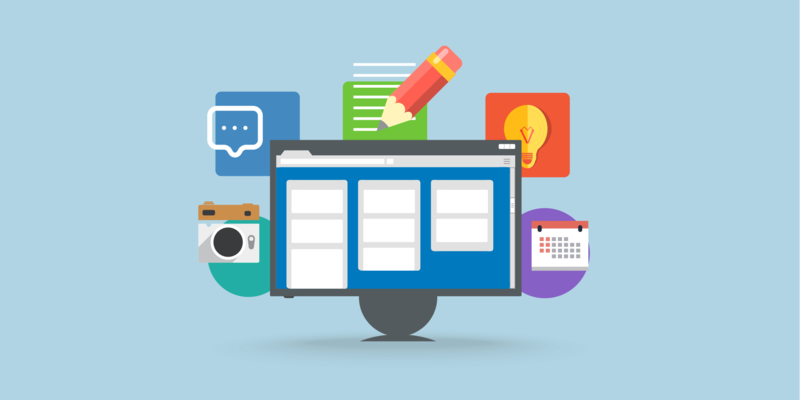 Facilitate a more effective marketing team meeting by using a Trello board for meeting agendas and brainstorming. The best part of an event is celebrating its success. Here’s how to get there. Stay on top of every little detail when it comes to organizing an amazing event, from ticket sales to digital invite assets. Instantly see the status of every task related to your event. Visualize work in a calendar view and make sure everything, is going as scheduled. Keep everything organized by adding event details, customer contacts, media and assets to cards so the teams involved know where to get what they need. Facilitate a system for managing company-wide incoming marketing requests without endless email chains. Trust us: your marketing team will thank you with this workflow management system. Minimize wasted time and confusion by establishing clear guidelines and deadlines for all incoming requests. Get things done by empowering a member of the marketing team to prioritize and delegate requests accordingly. Manage bandwidth by using labels on cards for high to low priority and effort required to balance your team’s time. Always keep colleagues in constant contact with the status of their requests by adding them to their cards to automatically notify them on progress. 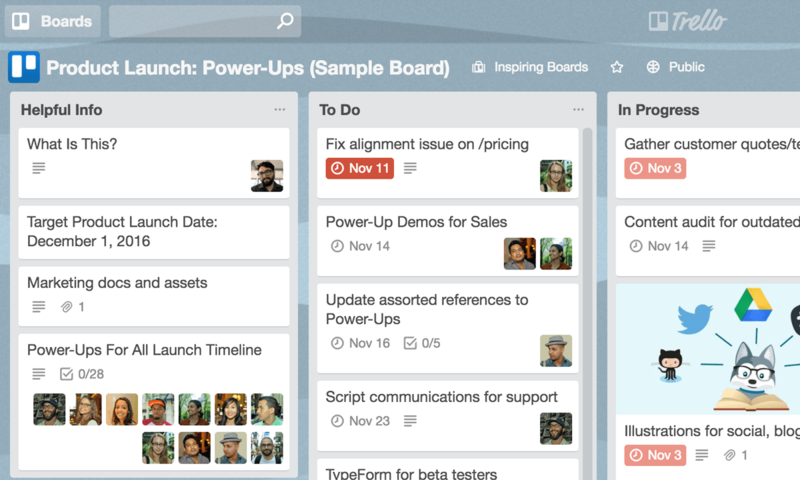 Seamlessly coordinate cross-team go-to-market brand and product launches with a single Trello board. 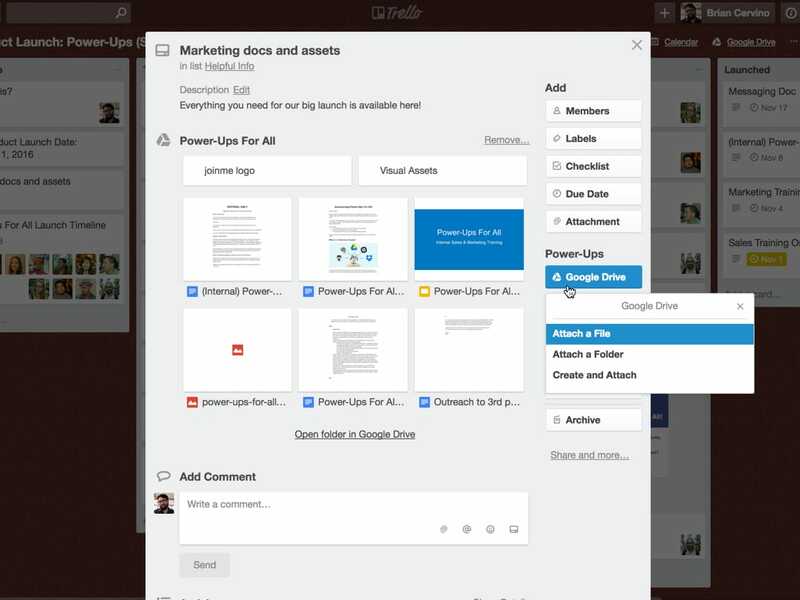 Manage all of your team’s communication, collaboration, files, and media without having to jump through different apps. Clearly see work getting done, who is doing what, and most importantly, what needs attention. 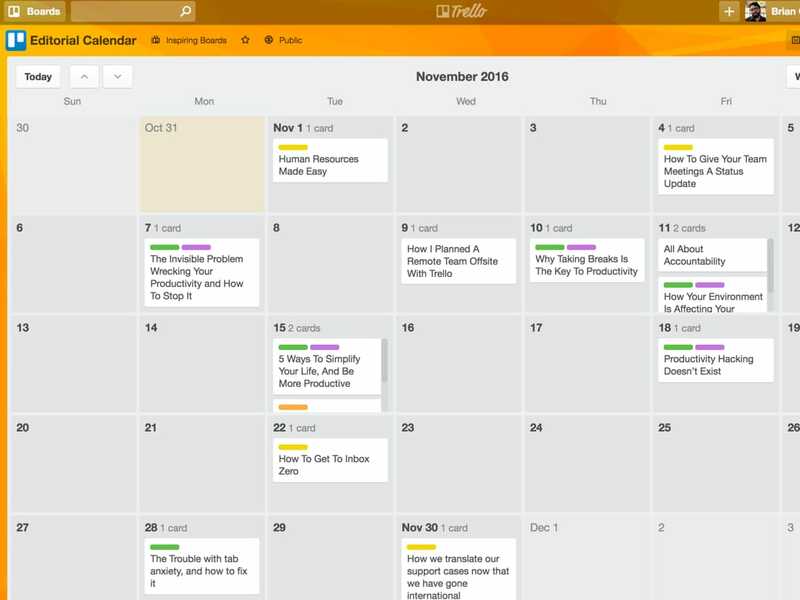 Make sure every moving part of the strategy is on track by organizing cards in a calendar view. 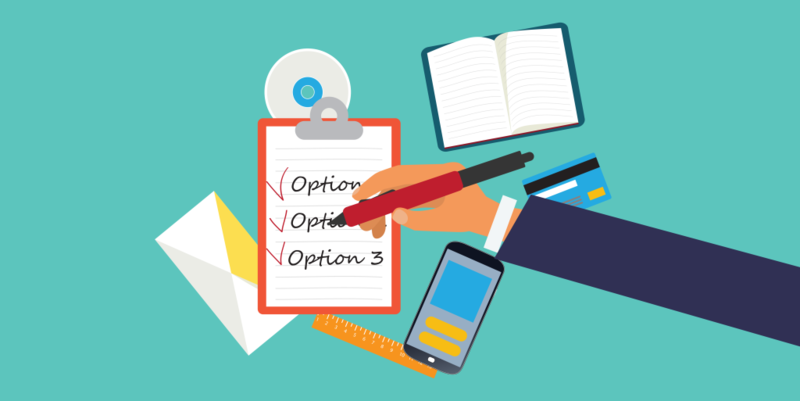 Execute effectively with a launch day checklist that clearly defines who is doing what and when for faster day-of management. 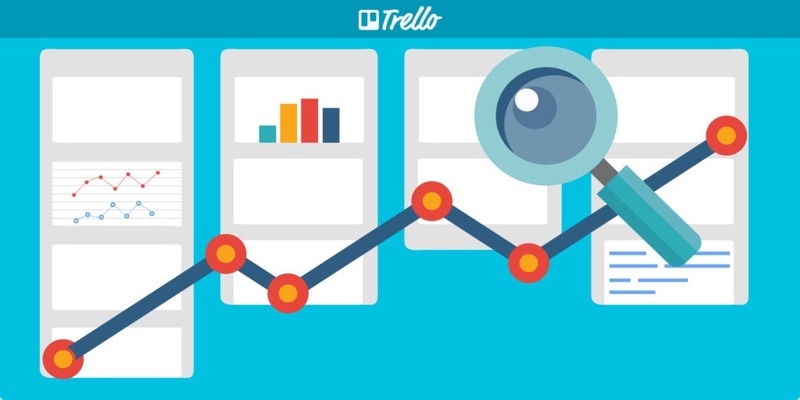 Learn how your Marketing Team can get more done with these free on-demand Trello webinars. 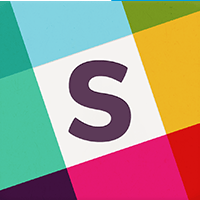 Turn “A-Ha” moments into actionable items by creating Trello cards from Slack conversations. Securely attach files and folders to cards to keep documents accessible in one centralized location. Save time by seeing when attached docs were last modified. 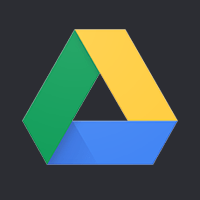 Instantly create and attach new Google Drive files and folders directly from Trello cards. Get perspective on your editorial pipeline by visualizing cards in a calendar view. 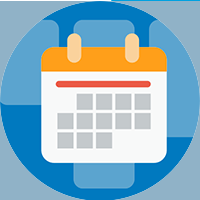 Keep your team up to date - just drag and drop a card on the calendar to change its due date. Always be ready when inspiration strikes! 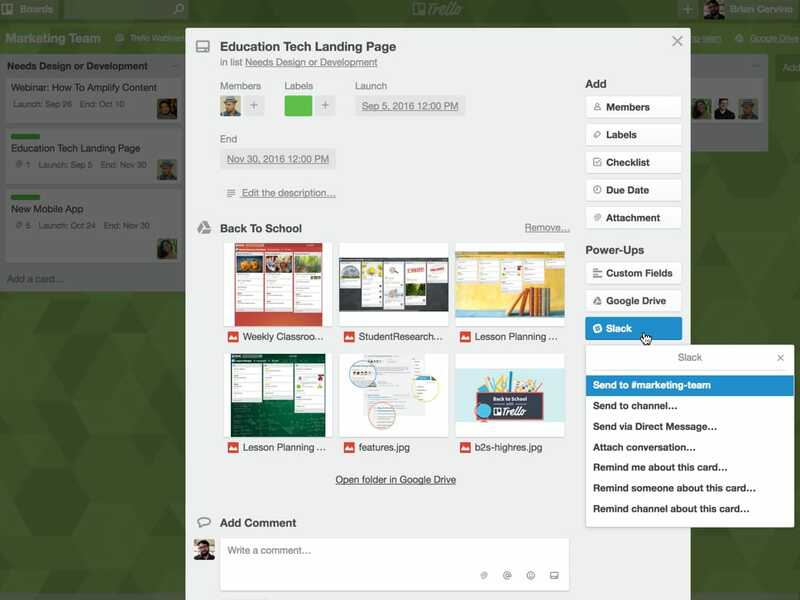 Capture ideas in Evernote and attach them directly to Trello cards. 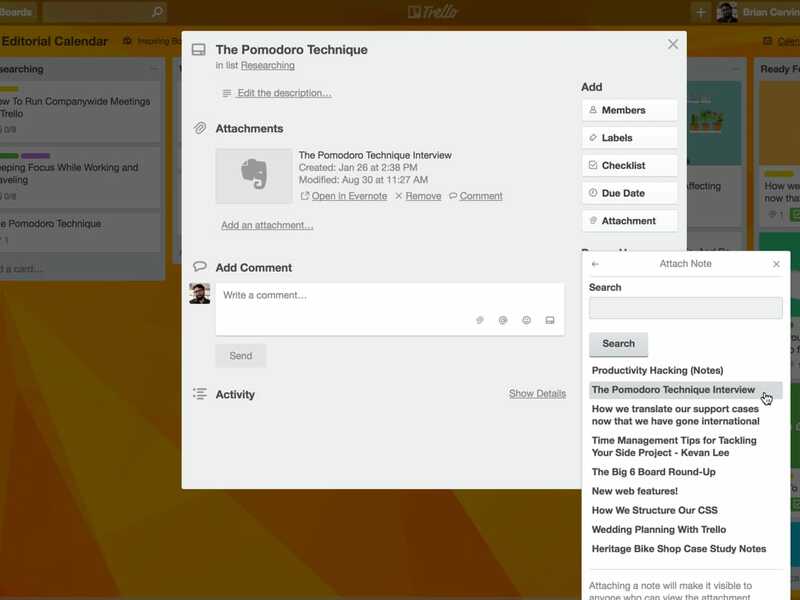 Put notes into a process and incorporate them into your collaborative Trello workflow with your team. Keep important notes at the tip of your fingers. 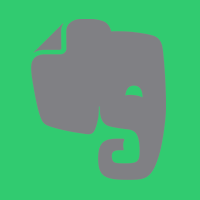 Easily create and attach new Evernote notes right from Trello cards. Easily access always up-to-date data from email marketing campaigns directly from their associated Trello cards. Create a collaborative discussion on newsletter layouts and copy in Trello by attaching Mailchimp templates. 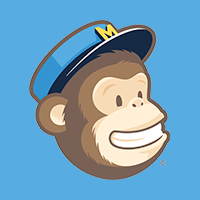 Avoid workflow friction by seeing when last updates were made in Mailchimp. In-depth posts for improving your marketing department workflow with Trello from industry leaders and the Trello team. 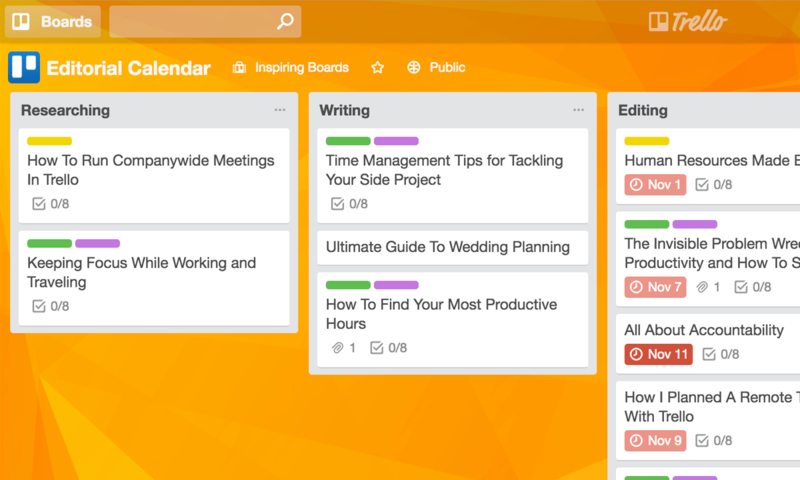 How we use Trello to create a collaborative editorial calendar without sending one, single email. Planning a successful professional event is no small task. It involves a number of different parties working together to get things done. OKRs are objective, quantifiable metrics for measuring success on any project or goals for your team. Learn how Buffer is making them visual with the help of Trello. 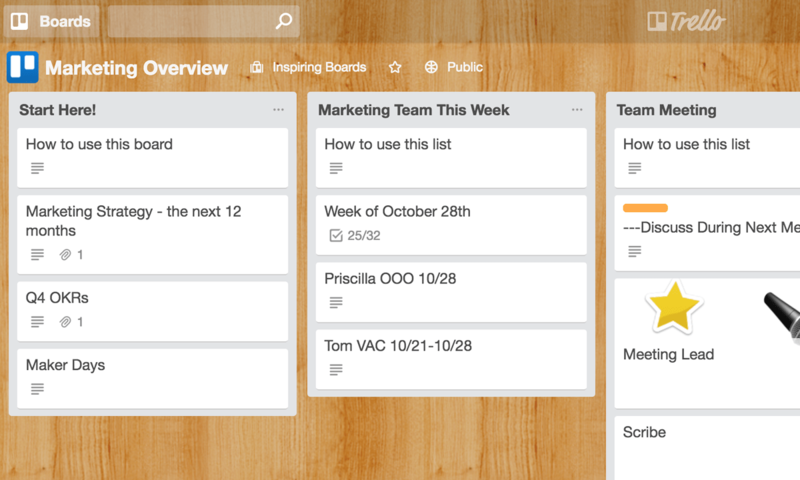 Marketing teams of all shapes and sizes work smarter with Trello.